Not a lot of folks are familiar with my breed yet because I haven't been around as long as some. I'll bet I get real popular, though, because I have a lot of good qualities. 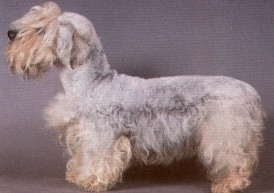 I have seen my name as Cesky Terrier and also as Bohemian Terrier, but they're all the same to me. I am very intelligent and well-behaved and I make friends quickly with people of all sorts, types and ages. My soft, long coat is non-shedding and should be groomed with clippers instead of stripped like most terriers. My breed was developed for the purpose of hunting small vermin, but if you don't have any vermin in your yard, I'll be happy just to be your dog friend. When fully grown, I am between 11 and 14 inches tall (27.9 to 35.6 centimeters) and I weigh between 13 and 20 pounds (5.9 to 9 kilograms). We have no Czesky Terrier Breeders listed at this time. Click here to place your Czesky Terrier Ad!